Few of us make much out of the endless weekend hours we spend together when we're young. Draping ourselves throughout our friends' houses and airing out the angst and dreams and heartbreaks that will shape us before they fade away with time, we may make mixtapes, or weave friendship bracelets, or simply craft inside jokes and rosy memories to cherish in years down the line. But for Dublin folk rock quintet Little Green Cars, those Sunday afternoons may have built the most important adventure they'll ever take. The band - now a quintet of 20-year-olds with a habit of waxing deadly serious about their ever-expanding ambitions - convened in 2008 in a bungalow in Stevie Appleby's parents' backyard for as ordinary a reason as any: as the frontman admits sheepishly, they wanted to win a battle of the bands competition. With guitarist Adam O'Regan and bassist Donagh O'Leary friends since primary school, and the rest having met in secondary, the five rehearsed for the gig, at which they promptly lost out to another local band. The defeat, however, was surprisingly fuel enough. It inspired them to work harder, to work through their remaining two years of school, during which they produced a massive catalog of demo recordings, blending acoustic and electronic, classical and punk, djembe drums and synth strings. 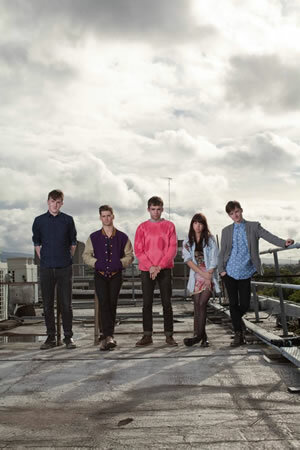 Then, in 2010, not long before graduation, then-rising manager Daniel Ryan found them at one of their sparse live gigs. With just one client already under his wing, he approached the quintet with a terrifying yet exhilarating ultimatum: Do you want to go to university, or do you want to really be in a band? "That was the first time we considered looking that far ahead," says guitarist/vocalist/primary songwriter Faye O'Rourke. "We were trying to avoid thinking about the future because of the prospect of college, but..."
"Stevie and I never did anything in school. Ever, ever, ever," says O'Regan, only half-joking. "Certainly, we put all our eggs in one basket. People always teach you that you've got to have something to fall back on, but we figured, by that logic, if we put everything into music, it can't fail. So, that's what we did." And like that, they dove in. For two years they redoubled their efforts, crafting a wide-eyed musical narrative that mirrored their evolution as an ensemble until, inevitably, label suitors began to knock. In 2011, they signed to Glassnote, where they've been quietly boiling down those demos into an album - the first they've ever recorded. "The main thing I want to hear out of an artist I admire is the truth," says Appleby. "How they really felt. If I'm going to say something, it may as well be the truth." The lengths to which Appleby, O'Rourke and the rest of the band will go to tell that truth have yet to reveal their depth, but a full-steam-ahead debut record is a good place to start: finally, five years' worth of backyard Garage Band tracks have a name: Absolute Zero. The songs of Absolute Zero have only begun to see the light of day, because, as Appleby puts it, "we've always been more interested in recording and writing and experimenting with everything than in touring. The past five years was time spent finding our sound, finding ourselves. We've gone through everything, from acoustic guitars to electronic music. We needed the time to grow up as people and as musicians." In other words, this is a debut that is a sum total of its creators' ascent to this moment. It is a desperate, under-pillow diary; a painstakingly lettered love note dropped in a locker; a collective, yet very personal, dissertation. On the record's debut single "The John Wayne," a fierce paean to the ones who so easily break our hearts, the lot of them proclaim, "It's easy to fall in love with you/It's easy to be alone/It's easy to hate yourself when all your love is inside someone else." On "My Love Took Me Down To The River To Silence Me," O'Rourke is torn between the heartbreak and the healing that comes from being heartbroken, "But my heart burned out til it was no more/still I wait on the ground, I don't know what for/There is a heart in you/where is the heart in me?/This love's killing me, but I want it to." And by its early-morning close, when Appleby asks, "And who will write and who will fight for this man/I know I am?/And if you're running out of space/Please don't erase your time with me," it becomes clear that it's not just love Little Green Cars are grasping at: even amidst an ex-lover's plea for acknowledgement, the search has grown far beyond that. Absolute Zero's 48 minutes, crafted in unabashed earnestness with the aid of seasoned epic-producer Markus Dravs (Mumford and Sons' Sigh No More and Babel, Arcade Fire'sNeon Bible and The Suburbs, Coldplay's Mylo Xyloto), act as a soul-bearing report, as guileless as the young quintet themselves, on the act of simply growing up: a process that requires, at once, so little and so much effort it could explode you from the inside at any moment. "This record constantly jumps between two contrasting perspectives: the beauty of a reckless youth and the fear and confusion caused by our ever-pending adulthood," Appleby explains. "It's a hopeful and nave look at love and life in general, which gives the album its bright days - but also deals with isolation, unrequited love and madness, which give the album its long nights, its nightmares. We wanted to express both a feeling of strength and vulnerability, so the work had to encompass both the light and dark." Most of all, they're hoping to find they're not alone in their search. "These are all feelings we've had, as a group or as individuals. We hope this is something people can relate to. That's always been why music has been written: it's a voice for people who don't have a voice. Hopefully someone can find some sort of comfort or solace in this. " Fresh off a whirlwind month of touring that included several CMJ showcases - ones that caught the attention of outlets like NPR and the New York Times - the band will be spending the next few months leading up to Absolute Zero's release preparing themselves for whatever comes next. Because once it drops, all they'll be able to do is to keep their hands outstretched and wait patiently for listeners to reach back.